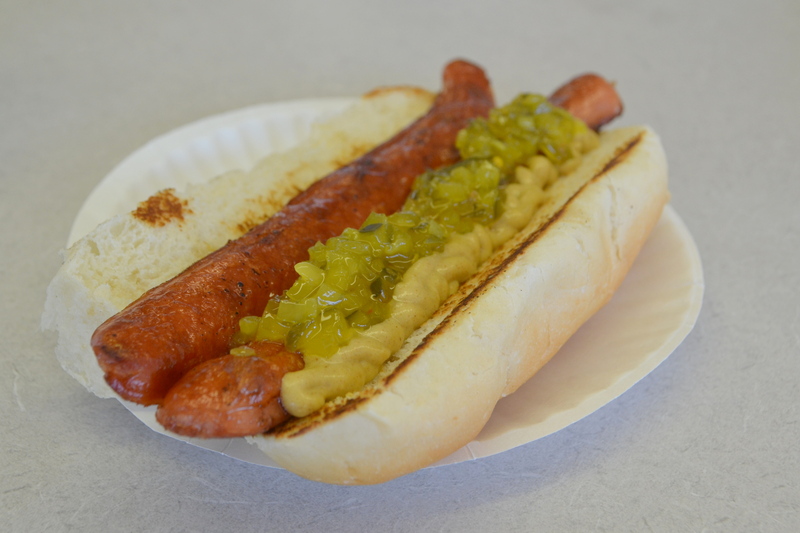 Swanky Franks has been serving dogs, burgers and fries for decades. The search for a decent dog in Fairfield County has been difficult. 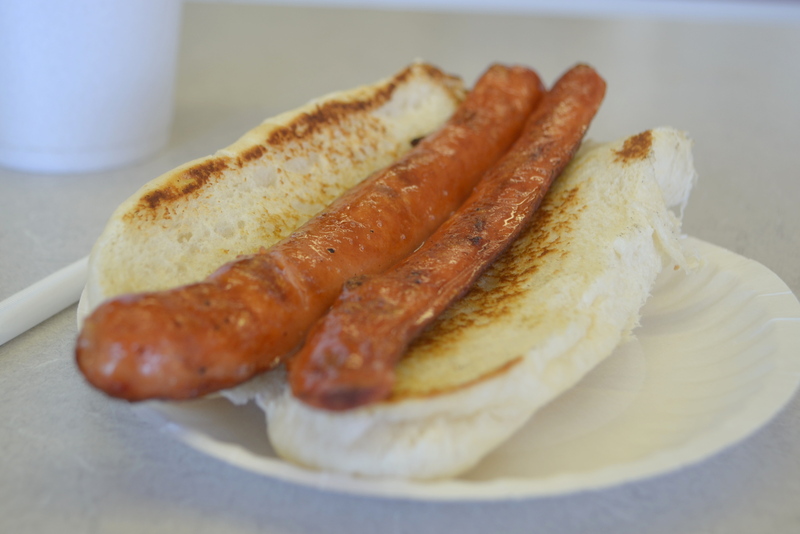 They serve Boars Head and offer hot dogs, grilled dogs, Swanky red hots, a variety of burgers and sandwiches, and fried seafood. A basic dog is $3.50. I sat at the counter and ordered a single dog and an iced tea. The server was friendly and pleasant, a throw-back to those seen on sit-com diner servers of the 60’s. I asked her for the men’s room and she giggled a little and told me it was around back “still in this building, but outside.” Granted this is a side of the road dog and burger joint, but it is 2014, not 1955 and that may have been the last time the bathroom was updated. I was not going to touch anything, and I now understood why the server giggled. Disgusting is upside. When I returned to the counter, the dog was already sitting in front of my iced tea. It almost looked lonely sitting naked in a bun on a paper plate, but since I did not order any toppings, it was what I ordered. It was split down the middle. I added a little mustard and green relish. My first bite was a disappointment. There was very little flavor in the dog. This about as basic a dog as one could imagine. What was more disturbing was watching the cook. He did not wear gloves and as I watched him prepare other orders he would grab raw bacon, then grab a few slices of cheese and then the rolls, all without washing his hands. 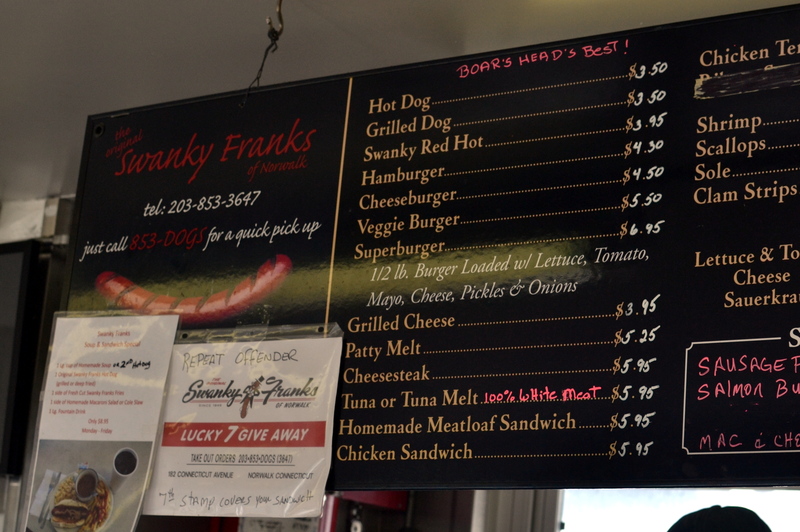 Swanky Franks is what it is and I understand it is a side of the road dog place, but nostalgia did not win my heart and stomach. It has been a few years since I visited Coalhouse; It was during its opening weeks. I was impressed by the lightness and flavor of the dough (the original dough maker was from Red Hook in Brooklyn) the sauce and the delicious toppings. I sat on a beautiful evening at a table outside watching the crazy drivers jockeying for a parking spot. 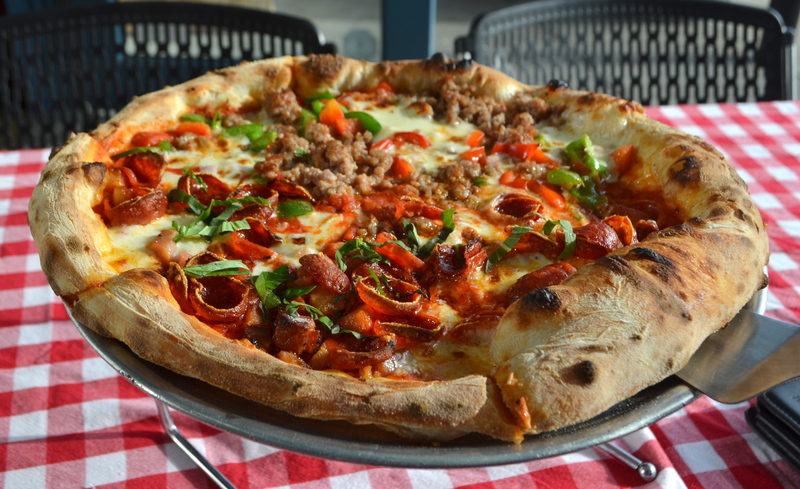 It was early in the evening, there were very few other guests and I ordered a 12” pie with half sausage and pepper and the other half pepperoni and bacon. 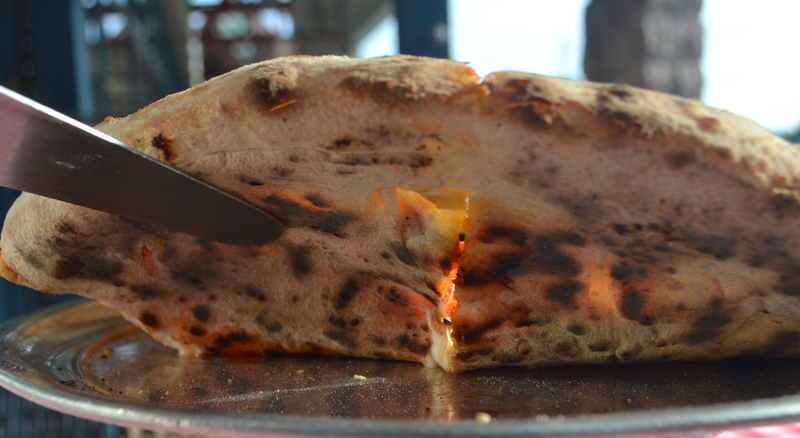 The crust was nicely charred. I lifted to look underneath, again nicely charred. Then I saw the first item of concern, holes in the dough, some of the dough forced back together after holes were made and then my biggest concern, the crust was soggy, charred and soggy, not a good combination. I cut the first wedge and tried to slide onto the second plate (my first was dirty and was replaced). A good portion of the topping stayed on the tray. I tasted the dough. This was a basic flour and water dough with little flavor. Gone was the soft, beautifully flavored crust from my initial visit; and it failed miserably in holding the toppings. I tasted the cheese; it was nicely melted but it was absolutely tasteless. Onto the sausage and it did not improve my impression, it had the texture of sand, and not flavorful. The next item was the red and green peppers. They were still basically raw, and there was no sweetness at all, bad grocery store peppers. The pepperoni slices were dime sized and so thinly sliced they curled into little salty circles. The cubes of bacon were either pure fat or over-salted cubes. The sauce had a little kick to it and might have been the highlight of the pie, but the bar was not set too high. Overall I cannot say anything positive about this pie. On a positive note, the server was very good. He replaced the dirty plate, asked if I wanted anything else and was incredibly pleasant during this escapade. As I sat there for close to 10 minutes after the pie was returned I assumed the manager would approach and ask what happened, but no one came by the table. That tells me that the pizza maker and the manager just do not care about the product or the guest. 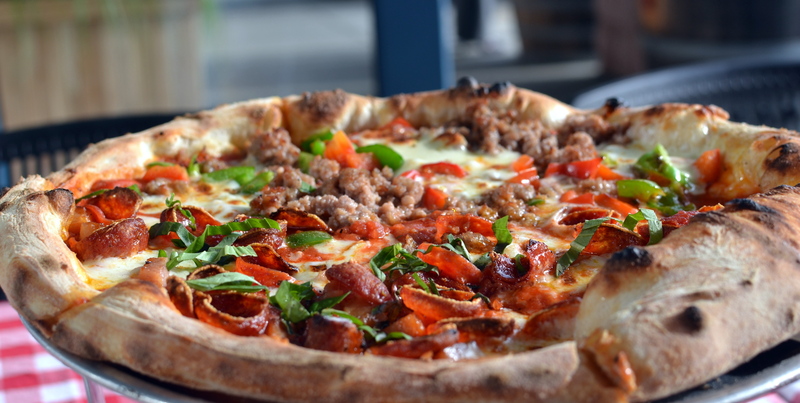 Others may like Coalhouse Pizza, but it will be hard for me to return. Five Guys, Five Guys, why Five Guys? On the way to enjoy some of the state’s best ice cream we stopped at 5Gs. I am not a big fan of fast food burgers, but since I was heading to Ferris Hill, it was the compromise I agreed to. I could have stayed in the car, but did not, I could have ordered a soda, but did not, I succumbed to my friends and placed an order, a small bacon cheeseburger with lettuce, tomato, fried onions and ketchup, plus an order of small fries and a drink. As I watched them prepare the burger I shuddered on the time it remained on the grill, I watched the patty move through rare…medium-rare, medium…on its march to well-done….why? I reminisced watching a similar process at White Castle 50 years ago…cook ‘em til their gray. The buns were dutifully lined up across from the griddle, toppings applied and when the burger reached well-done, it joined them in the queue. The compiler constructed my burger, wrapped it, added to the bag already laden with a small fries and called my number. I grabbed a drink, joined my party at a table, opened the bag to an explosion of steam, the fries were definitely hot and freshly prepared, why serve every potato in Idaho in one bag? The burger was tall and my first bite confirmed my previous impressions. This was an OK patty, with the majority of the flavors coming from the toppings. There was some juiciness to the patty but its preparedness to well-done was still, in my opinion, a bad idea. The fries were crispy on the exterior, soft, inside. But why must they give so many fries, again quantity is Five Guys the trump card. Overall I understand the love-hate relationship people have with 5Gs. For me, I just do not get it. 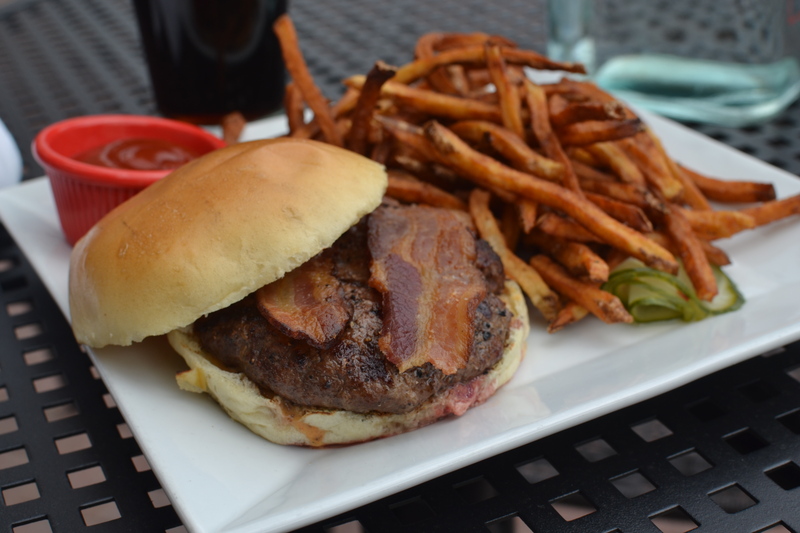 Each year I develop a list for CTbites for the Best Restaurant Burgers in Fairfield County. The 2014 list added three additions from 2013. The first that requires a specific call out is Mama’s Boy. In addition to fantastic Low-country food and vibe, they are preparing one great burger. Mama’s Boy (SONO) – The “Mama’s Boy Burger” is the third newcomer to this year’s list. It combines local grass fed beef with house-smoked bacon, fried Vidalia onions and pickles, encased in a brioche bun. (The current burger now includes pimiento cheese). The 5-6 ounce patty was perfectly seasoned and the bacon strips added a significant amount of smokiness and a touch of saltiness. The fried onions (nestled under the burger) were soft and sweet and adding a few of the pickle slices added sour notes. Served with shoestring fries, this is another great item on their menu. 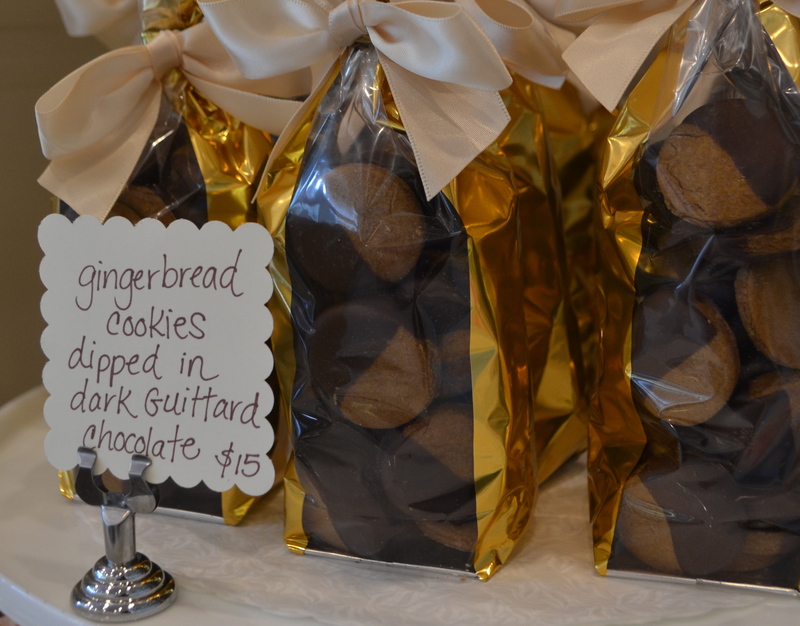 “gingerbitz” is opening its doors in what owner Karen Zuckert calls the store’s “dress rehearsal” and I was invited for a sneak peek and sample several of Karen’s delicious creations. 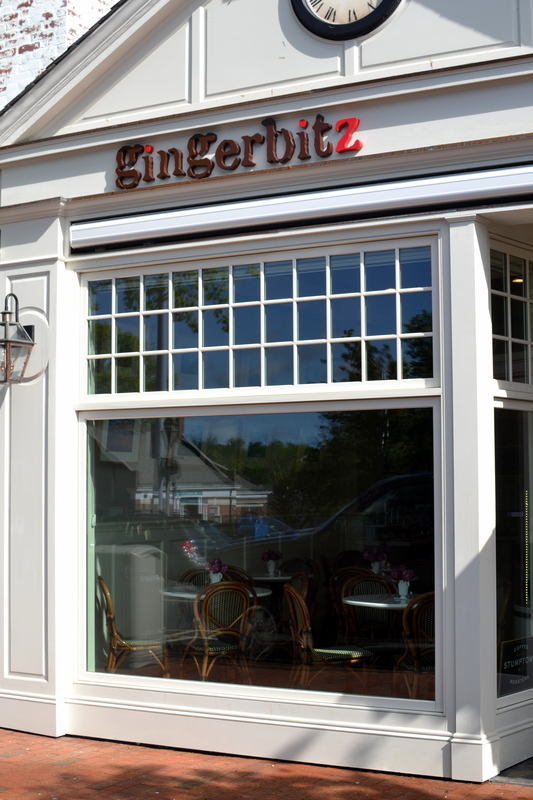 Described as a bakery and café, gingerbitz is a welcome addition to New Canaan, which has yearned for a local bakery for many years. 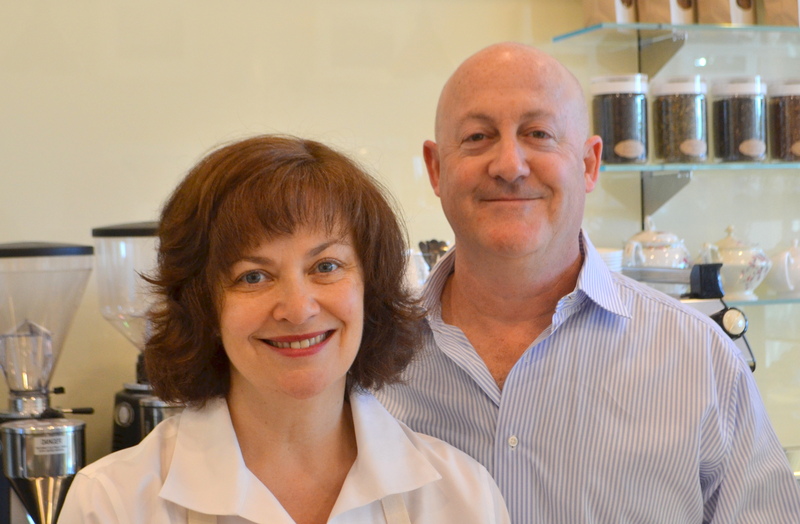 The longtime dream of New Canaan residents Andrew and Karen Zuckert, gingerbitz represents years of dedication. Karen is well known within Fairfield County for her amazing gingerbread houses that have graced many mantles, as well as featured at numerous holiday festivals. When the opportunity arose to open a bakery in town that would “broader showcase Karen’s talents,” the couple jumped at the opportunity. They painstakingly and meticulously renovated the location, developed relationships with vendors to provide organic products and Andrew embarked on his search for the perfect coffee. 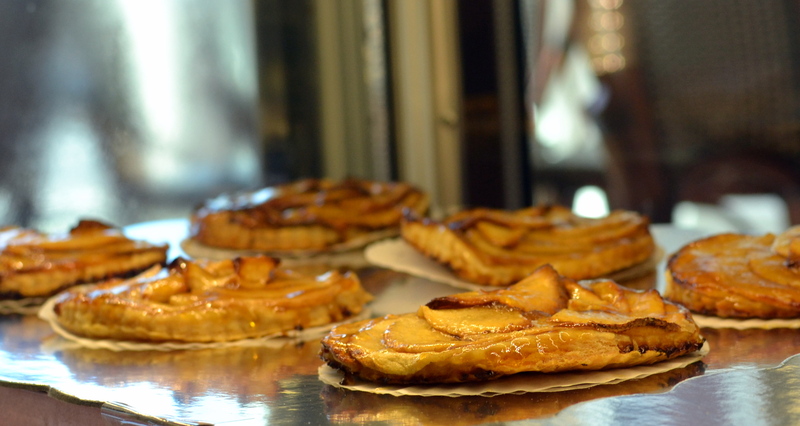 The welcoming aroma of the coffee and the faint buttery fragrance of breakfast beckons you to stay and enjoy the coffee and a pastry, pie or cake at one of several tables. Andrew researched numerous vendors and traveled the world before choosing Stumptown Coffee, out of Portland, Oregon. “They represented one of the most responsible coffee growers, are selective in the bean’s origin and offer several blends.” gingerbitz will initially offer two of these blends, the “Hairbender” and its bolder cousin, “Holler Mountain.” I sampled two cups of the Hairbender and it was also bold in its initial profile and was a perfect partner to Karen’s baked delights. At lunch, the menu expands to include the soups and sandwiches of Chef Ashley Boucaud. Chef Ashley hails from the Caribbean, graduated from NYU and then followed her culinary passion and graduated from Johnson and Wales University in Providence. The opening selections include cream of mushroom soup, chicken soup, plus a ham and brie or a roasted chicken sandwich. For a healthy drink, gingerbitz will serve freshly squeezed orange juice or ask Andrew for a glass of freshly juiced organic carrots, kale, or other organic vegetables. At lunchtime, gingerbitz will offer these juices as a smoothie or combine with the soft serve ice cream for a more decadent drink. In my first visit I sampled many of Karen’s creations. Overall these items were delectable and proved that high quality ingredients do not need an overabundance of sugar. Each of the items were mild in flavor and showcased the natural flavors of the ingredients, were not overly sweet and were reminiscent of those made at home. The Key Lime Pie was sublime. The thin graham cracker crust and key lime filling were topped with a dollop of whipped cream. The filling was smooth, creamy and presented subtle lime flavor, and the thin crust presented balanced and wonderful combination. The Carrot Cake included the traditional carrots, walnuts, and cinnamon, with a touch of nutmeg and topped with a cream cheese frosting. The balance of the cake and the rich frosting was delightful, again mild in flavor. 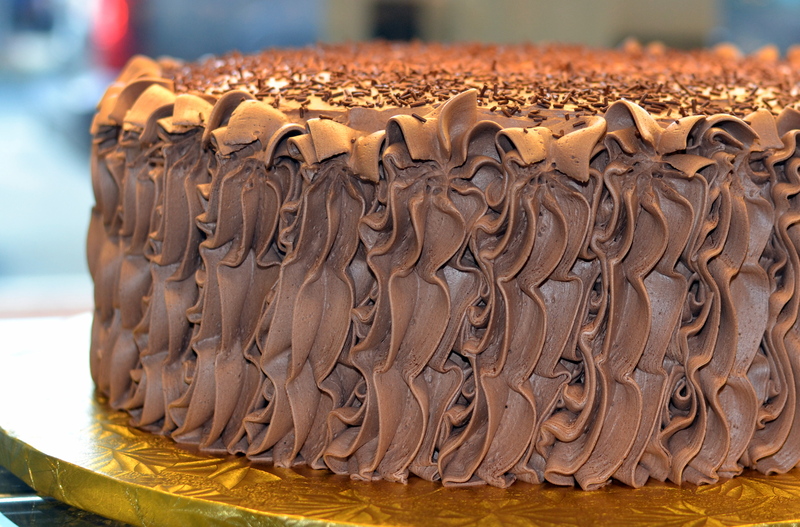 The two-layer Chocolate Cake contained chocolate mousse between the layers and frosted with a chocolate buttercream. Reminiscent of the chocolate cakes of days past, this was an outstanding combination of a mildly chocolate cake, and a creamy chocolate frosting. 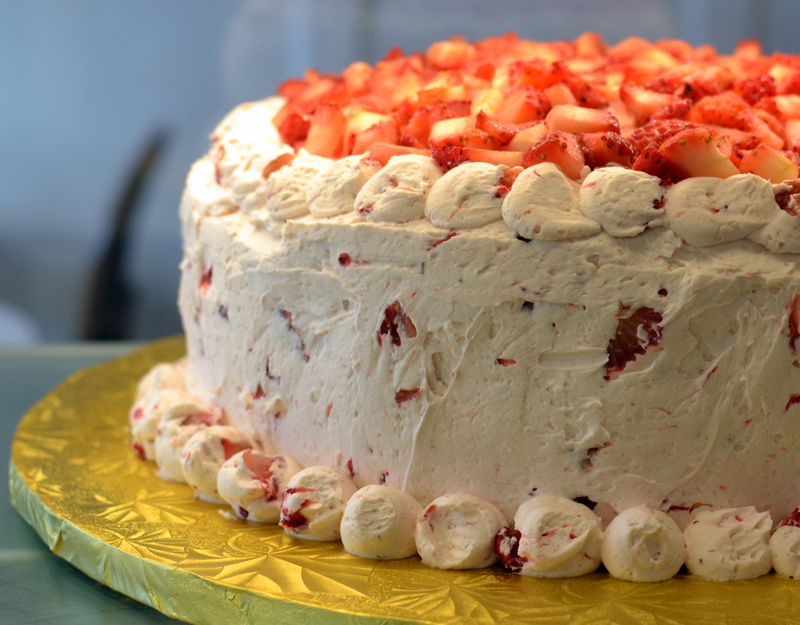 For the fruit lovers, the Strawberry Crisp was incredible; delivered full strawberry flavor, complemented by the slightly sweet and the cinnamon streusel topping. And don’t forget to take home a few cookies for the kids. 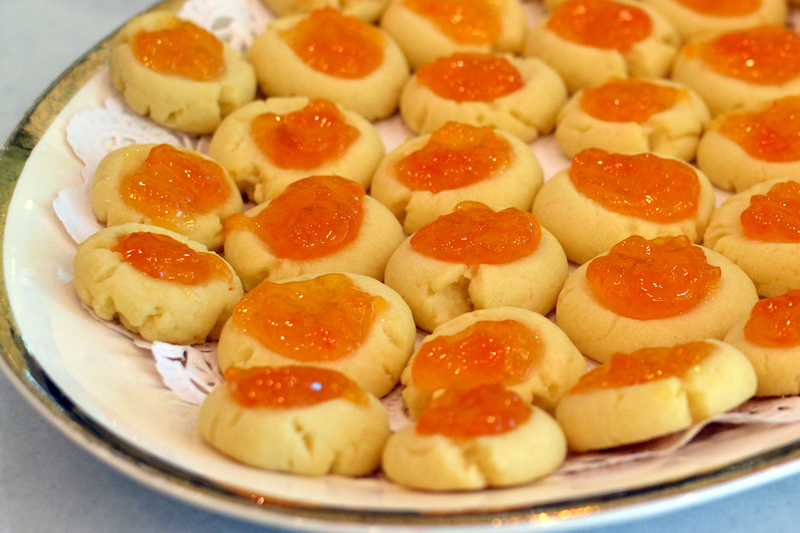 The Apricot Thumbprint cookies were buttery and the apricot jam was delicious. 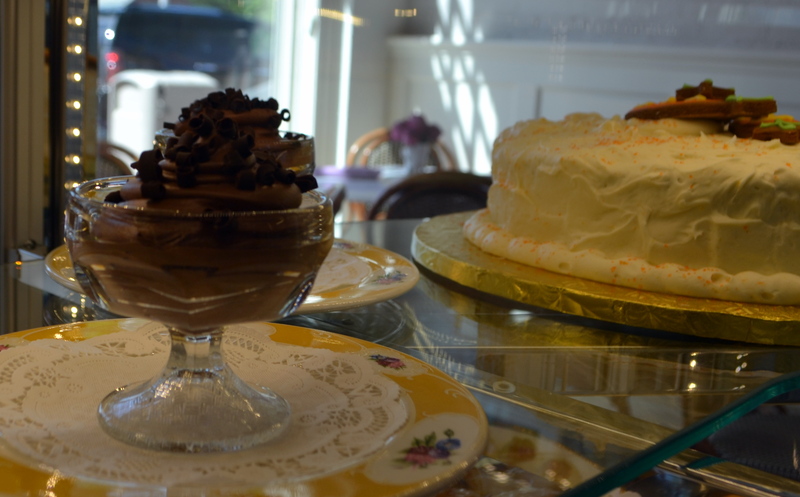 As gingerbitz slowly extends its hours and expands its offerings, I look forward to enjoying some of the best cakes, pies, tarts, and gingerbread creations from Karen Zuckert.